Charlie Taylor is loving every minute of playing in the Premier League and the Burnley full back feels that he’s stepping up to the challenge. The former Leeds United defender hasn’t missed a minute of action in the top flight since September, when selected for the 2-0 defeat against Manchester United at Turf Moor, and featured in both FA Cup ties against Barnsley and Manchester City. The 25-year-old, who made a couple of appearances for England Under 19s in 2011, as the Three Lions won the Limoges Tournament, has soldered an effective partnership with Dwight McNeil on the left hand side and is determined to continue on an upward curve. “I’m loving playing every minute in the Premier League,” he said. “I want to keep on improving. I feel good and I feel fit. It’s the toughest league in the world, so I’m glad to be a part of it. 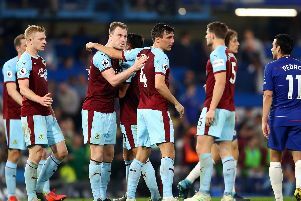 Defeat against Crystal Palace at Turf Moor was the first time that the Clarets had lost two games on the bounce since Boxing Day. Sean Dyche’s side had embarked on an eight-game unbeaten stretch in the league in-between, the club’s best run at this level since 1966, but Taylor confirmed that the mood from that spell hasn’t dissolved in recent weeks. He said: “We don’t get down. We’ve got a massively tough game at Liverpool next Sunday, but we need to get back to it, and get back to the level of performance we showed against Spurs. “I thought it was strange [against Palace]. In the first half, I thought we played some really good stuff, but it was just that end product that was missing. That’s what we need to get better at. “I thought we played some really good stuff. We threatened their goal a lot and made a few chances, so it was a strange one. In the second half, we will hold our hands up and say that we weren’t good enough.